The new Wicked FPB sports some hot angles, not the least of which is the glazing system surrounding the great room. There are numerous advantages to these outwardly angled windows. Windows stay drier (from the overhang) and water slips off faster. This means less salt build up and better visibility. They are much easier to clean. Simply run a squeegee along the entire surface, rather than in and out of mullions. One size storm shutter fits all. Visual space on the inside is enhanced since your eye runs outward further. Window coverings lie on the inside surface of mullions regardless of motion. The air gap between window glass and shades -150mm/six inches – is a natural insulation barrier. In cold, damp climates a simple clear film seal will create an insulating air pocket and eliminate condensation on the window glass. The large overhang provides wonderful shading. 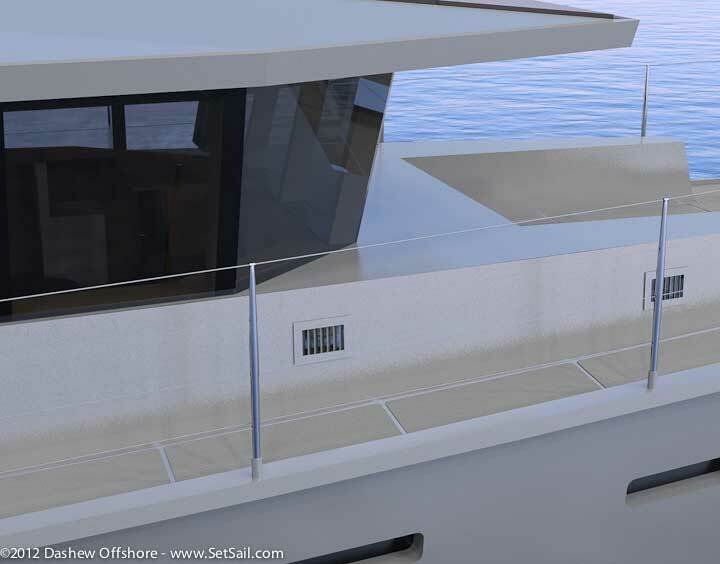 Outside, we have wider than normal side decks, with stanchions placed toward the outer edge of the rub rail (belting). This is to compensate for the outward push of the glass. Although the life lines are 1.1m/44″ tall, we want a hand hold system for going forward in adverse conditions. The solution will serve multiple purposes: there will be a “T” track fitted to the underside of the overhang over the center of the walkway. To this track will be fitted several sliding cars. If you need a handhold, grab a strap hanging off a car and slide it forward as you move down the deck. This can also be used with a safety harness. Furthermore, the straps can be used to transport heavy objects down the deck. The only drawback we see is the cool – some would say yacht-like – appearance these windows convey. We prefer a workboat/military aesthetic, both to fit in better with commercial vessels and to give the bad guys pause. After struggling with this for a while we have come to the conclusion that the Wicked FPB’s combination of bare aluminum and hot angles will almost certainly cause those of nefarious bent to look for softer prey. And the commercial sailors? They’ll know what this design represents and won’t be put off. This entry was posted on Thursday, February 2nd, 2012 at 6:28 pm and is filed under Dashew Logs, FPB Series Notes, Wicked FPB 97. Both comments and pings are currently closed. You have managed to keep us riveted to the computer hitting the refresh button for the next update. Is the window-tint an applied film or is the glass itself tinted? The window film is made by 3M, a ceramic (nonmetallic) product. I know the 3M films, to protect from sun. There are other security and safety films to protect glass doors and windows. Do you use this or (only) the light protecting versions? I like the angle of the windows. Looking at ~ 57 degrees removes all reflections. We just use t he film for UV protection and to reduce sun load. Talking of nefarious characters Steve.. how secure are the FPB’s in terms of glass and door? bullet proof and blast proof? piracy is a real concern so would be great to know you can be secure inside in the event of attempted hijacking and point the boat towards the big ocean! Best defense is to avoid confrontation and stay out of the areas where folks are heavily armed. Casual thieves will find it difficult to gain entry. But bullet/blst proof…. not likely. I don’t see much room for conventional pressure plates and gaskets around those windows (and in any case, pressure plates would mar the smooth appearance of the new design). Are you planning to use a structural adhesive/sealant approach for these windows- 3M VHB tape, perhaps, or the Dow 995 that’s used to glue skyscraper windows to their mullions? We have been gluing windows in for years so don’t think this will b a problem. 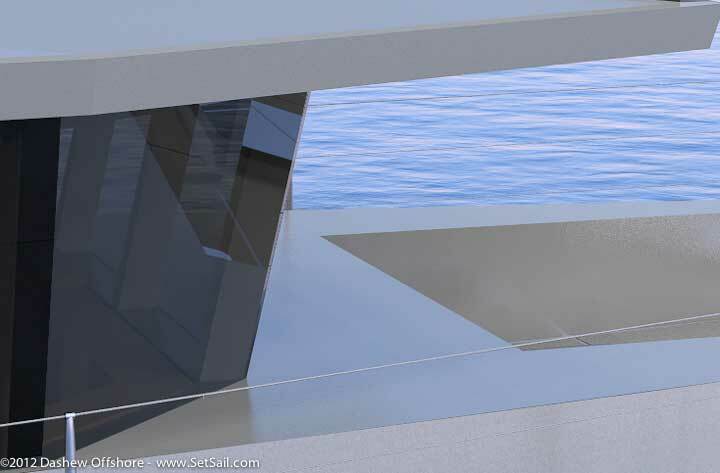 There will be a storm shutter system, using threaded inserts welded to the aluminum as we do on the other boats. Steve , I like the mullions. If those are 50mmx150mm then the weight should be slightly less than than 100mm square, but with an increase in their strength in the direction the water will probably hit. Some size, proportion, when reports from one picture to another are questioning me! We are well below 115 feet, right? If I blow your theatric event, just delay the post as necessary, no problem!!! I really like the way it is going!!! Steve another great design, but my question is range. Now at 11+ knots it states about 5000 NM range, how much could you actual range could you get with lower RPM? The increase in range that comes with slowing down is not as great with a design like the FPB 97, as a more trawler like shape because the FPB canoe body has comparatively little wave drag. Without looking up the numbers, dropping from something like 11.5 to ten knots might get you a net of 10/15% better range. If you really wanted to stretch things, and changed props for slower running, and detuned the engines, it might mean 20% gain ay 10 knots.